I remember the strong smell of coffee from the coffee shop in the High Street, as I used to work in the hairdressers above the coffee shop as a Saturday girl. I remember the strong smell of coffee from the coffee shop in the High Street too, as I used to work in the hairdressers above the coffee shop as a Saturday girl. I was 15 years old then. I can still remember that smell, amazing. I used to go into Lyons tea shop for lunch. I also remember going on the Christmas ride in Cawdells, I thought it was wonderful. Going through the tunnel at the end to see Father Christmas and to get your present. I have a photo of myself at the age of 7 or 8yrs receiving my present….Such great days they were. So many memories have come flooding back of Watford, reading everyone’s comments. The pond I remember it freezing in Winter. Cassiobury Park, I remember swimming there on many an occasion… great childhood memories….. This page was added on 12/03/2012. Yes, I remember a shop that roasted coffee beans and exhausted the “fumes” out onto the High Street, west side (late 1930s, early 1940s). I thought it was Kingham’s, the grocers, but my memory could well be wrong. I am not a coffee drinker, but I always thought that the smell when roasting was great, far better than the taste. I wonder if you knew of my mum at school, Jenny Sturgess, who as born in 1966 so would have been there about 1977? Her cousins Lynne and Sandra Tickner also went there I believe (Lynne definitely) and some of my mum’s family worked for Benskins also – her granddad was Albert Perry who I’m sure worked for them. She lived in Harris Road as a child and had relatives in Gladstone Road, Devon Road, Derby Road and almost all worked in town. Nice story Lyn ,I remember the smell of the coffee from the small coffee shop,and loved the smell , however i don’t like the taste of coffee and only drink tea, We went to Clements to see father Christmas one year and were given presents by Father Christmas, only to have them taken off us ,as my sister only had a ticket to get a present . (Cruel Father Christmas !) We went to the old Holy rood and St Catherine Of Siena in Horseshoe Lane Garston. We also moved to Australia Adelaide. 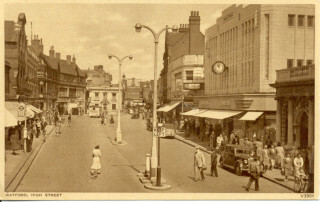 Looking for old photos of Watford from the 1960s , Hope there will be more on this site. I believe that one of the owners called the coffee shop ‘Adams Tea Plantation’ and the coffee was roasted in the shop window, I was never sure whether people stood there to watch the coffee being roasted, or they were just enjoying the smell.